Are you searching Wisconsin for a great selection of used trucks for sale in Milwaukee? When you are in the process of finding lifted trucks for sale, the thought of finding the Chevy Silverado lifted for sale may seem out of reach. That is why you need to come to Ewald’s Chevrolet dealers Wisconsin. Ewald's is where you will have access to an incredible selection of used trucks like a Chevy Silverado lifted for sale. Are you looking for used trucks for sale in Milwaukee with a leveling kit or even one with a 6-inch lift kit? Let us help you find the Chevy Silverado lifted for sale that you have been dreaming of owning at Ewald Chevrolet Buick. You can be back cruising the streets of Milwaukee in no time when you stop into Ewald’s Chevrolet dealers in Wisconsin. Scope out our used Chevy trucks for sale at Ewald Chevrolet Buick. A Chevy Silverado lifted for sale can get you through pretty rough terrain easier than ever because of added ground clearance. 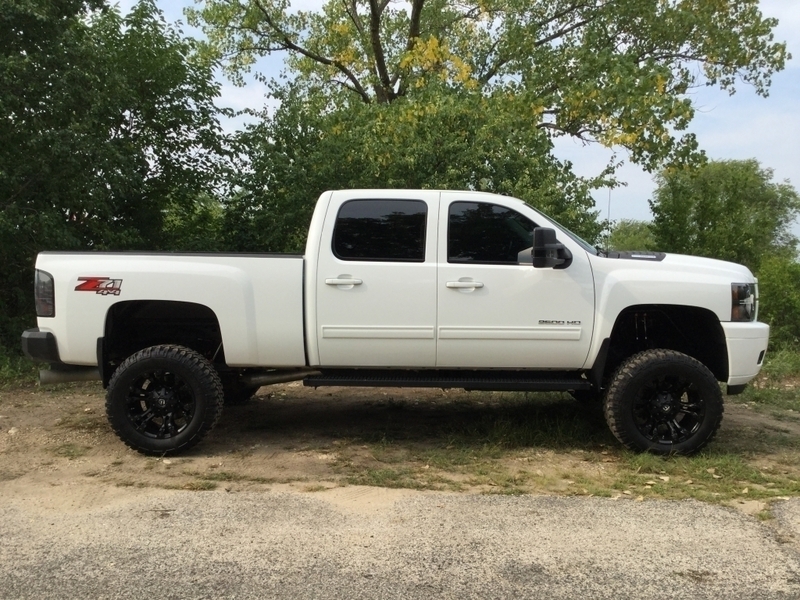 Find a Chevy Silverado lifted for sale that is customized with 6-inch lift and 20-inch black and milled wheels. Or even Chevy Silverado lifted for sale with only the slightest lift kit. Do you want to find used Chevy trucks for sale at Chevrolet dealers in Wisconsin that combine looks and performance? A Chevy Silverado lifted for sale from Ewald Chevrolet Buick can be the perfect fit for you. Chevy trucks for sale have been known for generations upon generations for their strength and power. The used Chevy trucks for sale at Ewald’s Chevy dealers in Wisconsin are built to do quality work. All with the strength and precision you would expect from a Chevy truck. Are you looking for impressive torque and horsepower in your next used Chevy truck for sale? Then check out the used Chevy Silverado lifted for sale that sports an incredibly powerful Duramax diesel engine. This Chevy Silverado lifted for sale comes nicely equipped. Find leather seats, a built-in navigation system, a rear backup camera, and much more. Why not come in and take this Chevy Silverado lifted for sale out on a test drive today? Cruise past other Chevy dealers in Wisconsin and come to Ewald Chevrolet Buick. Our incredible selection of used trucks for sale near Milwaukee will surely win you over. When it comes to used Chevy trucks for sale, like the Chevy Silverado lifted for sale, Ewald Chevrolet Buick is the only Chevy dealers in Wisconsin that you need. You can find Ewald Chevrolet Buick at 36833 E Wisconsin Ave in Oconomowoc WI, 53066. Or give us a call at Ewald’s Chevy dealers in Wisconsin at (262) 226-2842. Schedule your test drive or with any questions about our Chevy Silverado lifted trucks today. See what makes Ewald Chevrolet Buick stand out from other Chevy dealers in Wisconsin when you visit us today.